a miserable morning, but a few still went out……….. The planned team event was changed to an individual event due to the weather forecast (5 successive days of rain!). If odd players had dropped out of each team, the competition would have been a farce. Eventually we only had 9 players with the rain arriving. It probably was good weather for those golfers from Bergen! However, with only 9 players it was decided to cancel the competition. It is with great pleasure that the society committee can announce that the Viking Cup for 2019 will still take place on Tuesday 22nd October. 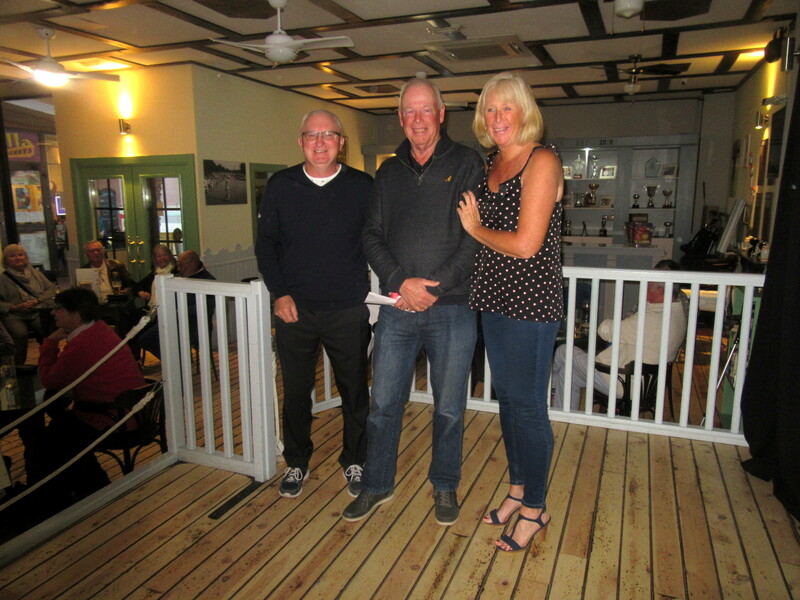 Two new representatives have come forward so that we can carry on the tradition of this annual event, their names will be announced in due course. All players must be currently paid up Society Members who will have played at least one Handicap Qualifier within the past 12 months with the Society prior to the Viking Cup date. 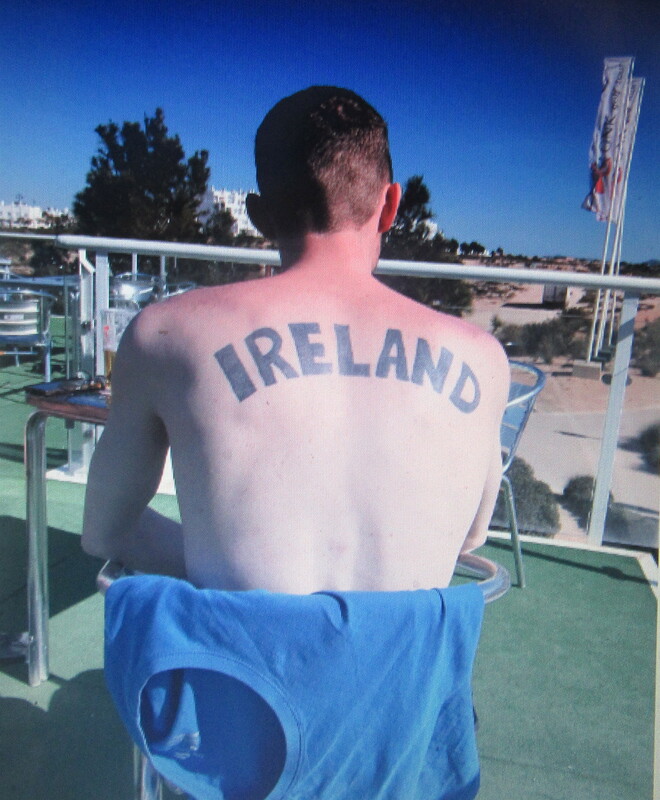 The UK & Ireland team is in place, a reserve list has already been started so anyone interested in playing for this year’s UK & Ireland team please send an email to Secretarycdagolf@outlook.com. 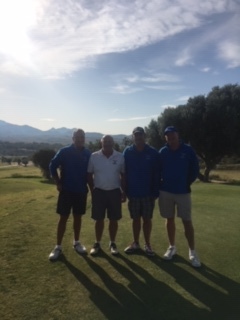 For the Europe team please send your email request initially to Secretarycdagolf@outlook.com and I will forward them onto the Europe Team representatives who will then be in touch. Thank you to everyone for your patience, looking forward to a fantastic 2019 Viking Cup. Anyone wishing to attend the captain’s day evening event on June 7th at the Zaira Celebration Hall in Bolneuvo should contact Alicia or Peter Reeves before May 11th as the restaurant need to know the numbers they need to cater for. It is 20€ per person to include several courses, beer, wine and transport. Selection of starters to share. Please choose fish or lamb for main course. Wine and beer with meal. It is the St George’s Day individual stableford on Monday (weather permitting) and next Friday is a pairs betterball. 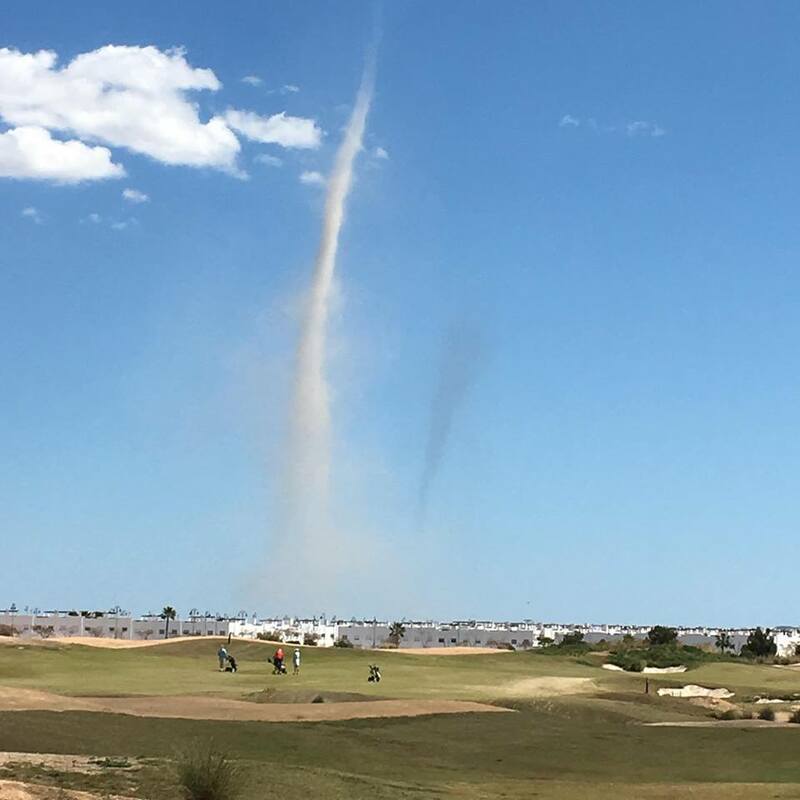 a couple of twisters approaching – those golfers may finish up in Oz, instead of the clubhouse…………..
64 players for this month’s Apollo Air competition, with glorious sunshine and calm conditions. Lots of good, but not exceptional scores. Andrew Fenton was clear by two points, with a log jam for the 2 divisional prizes. 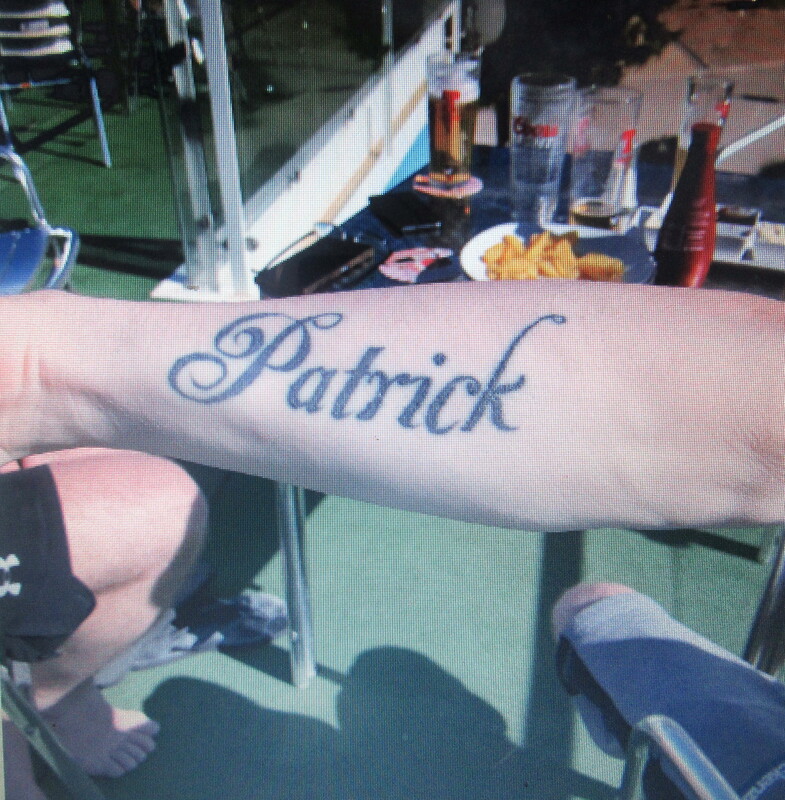 No photos of the overall and 1st division winners who had previous engagements. 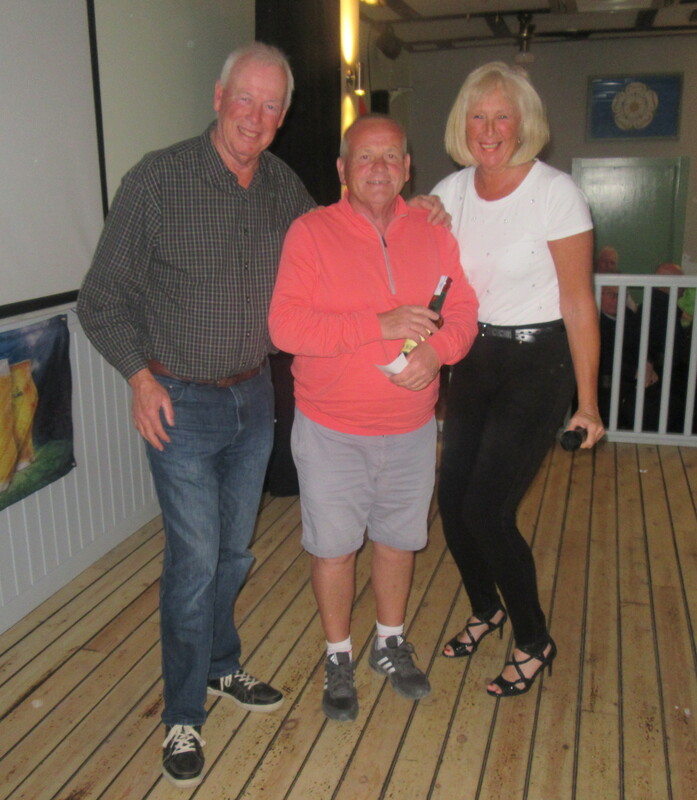 So that left the stage clear for Neil Simpson to pose for the camera – He’d spent 10 competitions getting 0.1’s back to get another shot on his handicap and first time out with his new handicap he gave it back! and this is the swing we should all try and emulate…………………..
Nice to play with Don Henry again, now a famous lawn green bowler. Unfortunately he has retired again, anyone want to buy three sets of clubs? And maybe a fishing rod? 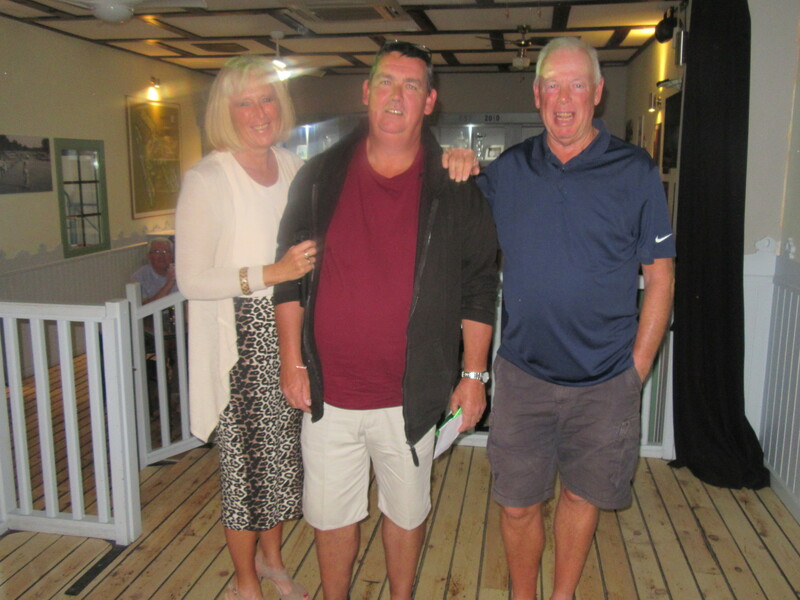 Don is not a bad golfer – just the unluckiest…………. 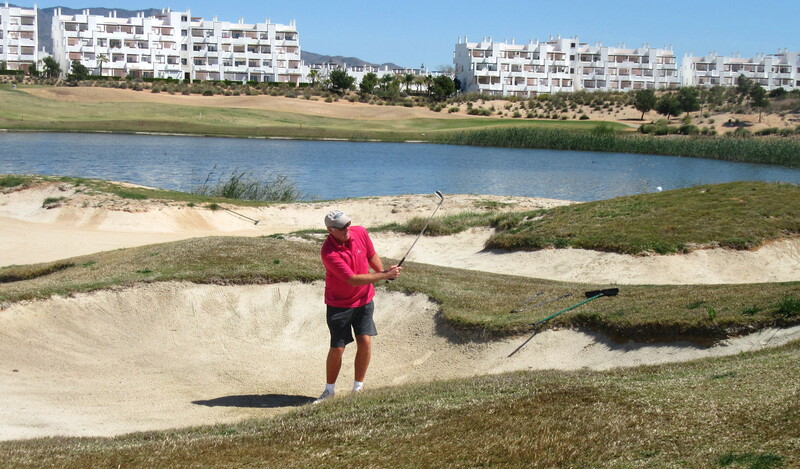 and I couldn’t leave out my other playing partner, Gary Ackroyd…. 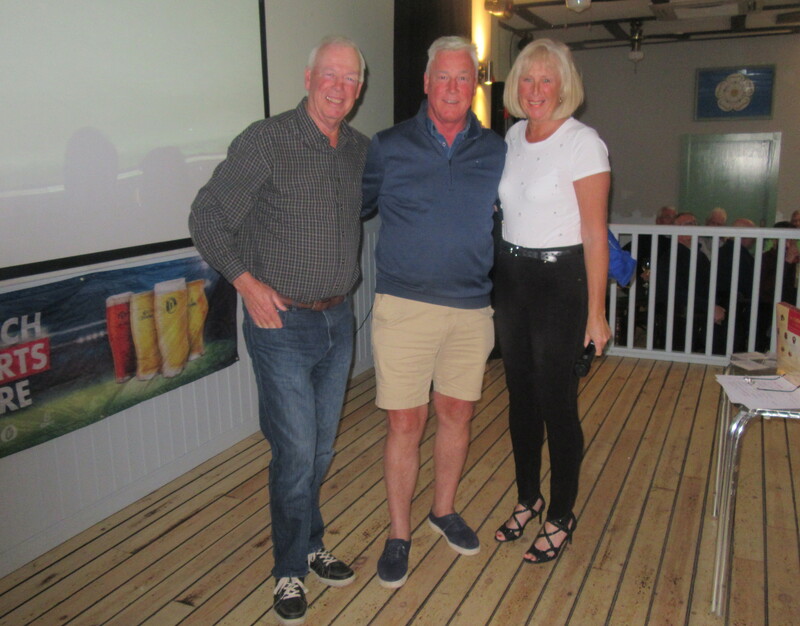 Competitions secretary Ken Saunders made it clear that the committee will try to revive the Viking Cup (which is at the moment in some doubt), but need a couple of Scandinavians to work with our two representatives to take it forward. Next week is a 4 person team event. 2 score on the par 3’s, 3 on the par 4’s and all to count on the par 5’s. The following Monday is the St George’s Day competition and the sheet is already full. 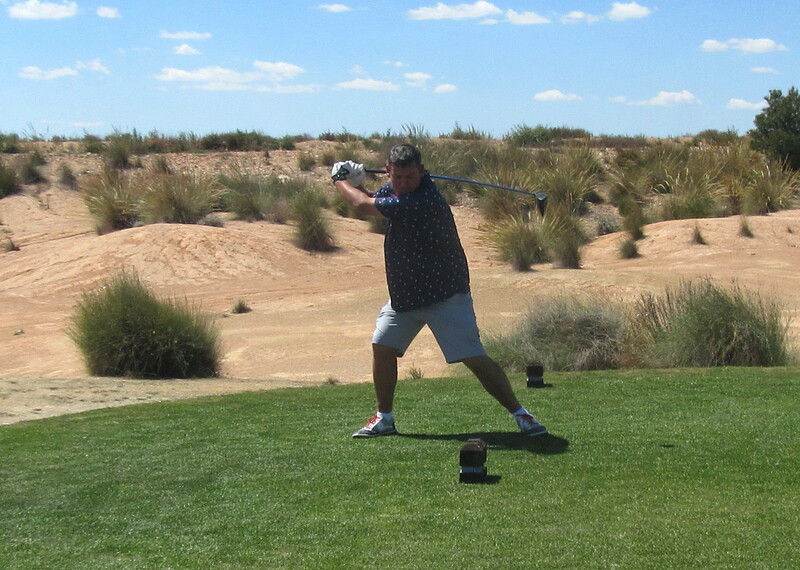 If you want to go on the away day to Desert Springs on Monday June 3rd contact Ken Saunders. If anyone is interested, I have managed to add photos of the non-golfers to the Ladies Day blog from last week. Go back to last Sunday’s blog to see who was there! The following photo definitely applies to me, Don and Gary (not Neil!). 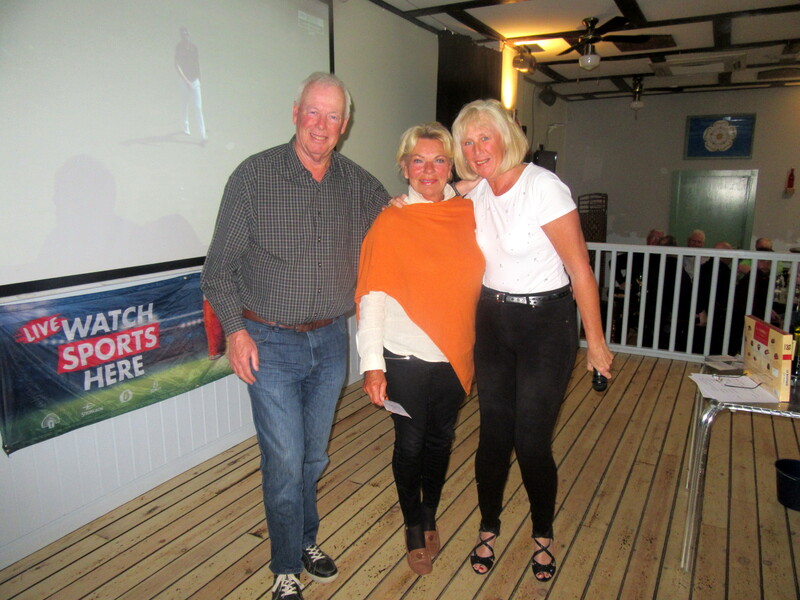 Torild (right) with runner-up Lynda……………….. 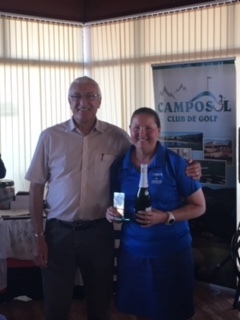 This ladies major competition was initially set up by Cath Emmett-Smith and this year was sponsored by Leanne from Eden Health & Beauty, who provided the major prizes and those for the non-golfers putting competition (plus cava of course!). The society added the nibbles and some other gifts. 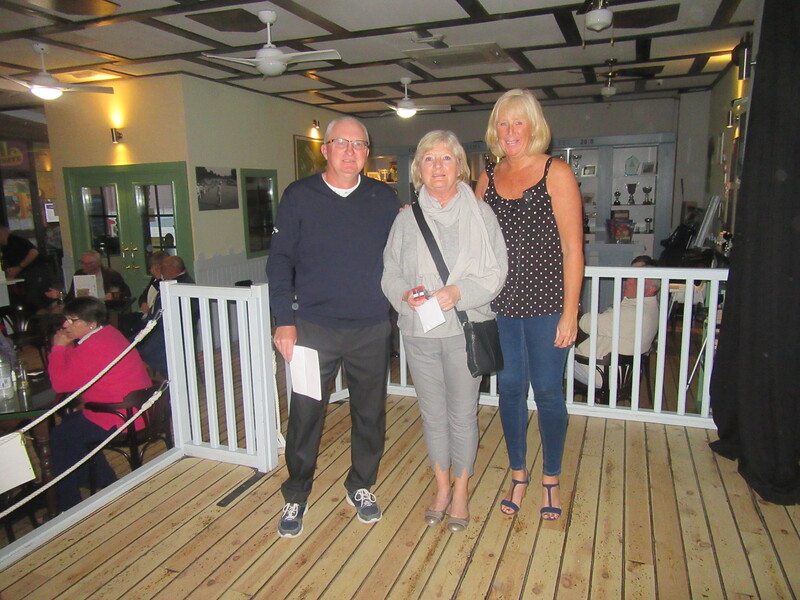 Again Tanya was our starter, and donations were made by Jane Mitchell, Astri Spieler, Peter Reeves and Ardis Cairney. The heavens opened about 3pm along with some gusty wind, so that resulted in several no returns from the men. 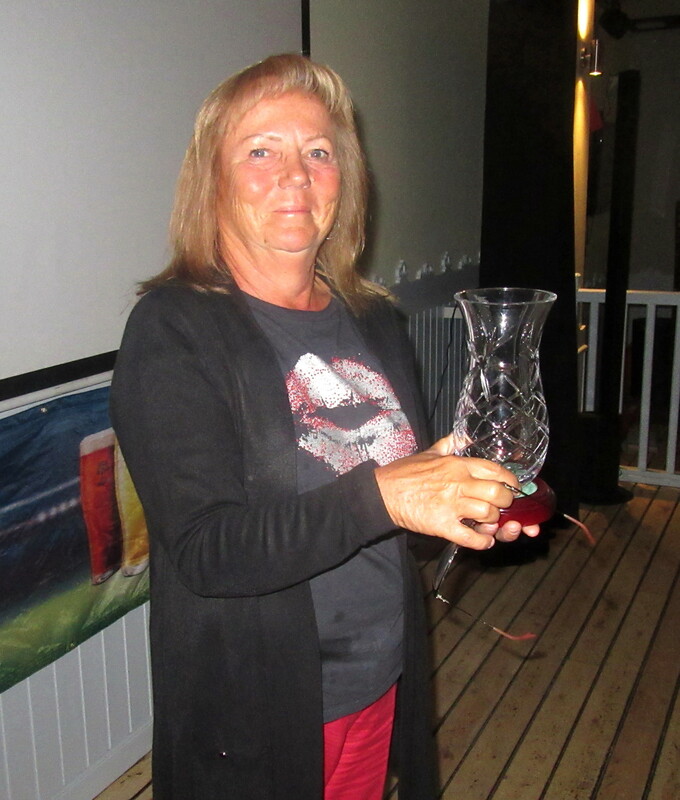 Torild won the par 3 aggregate and Lynda the par 5’s. 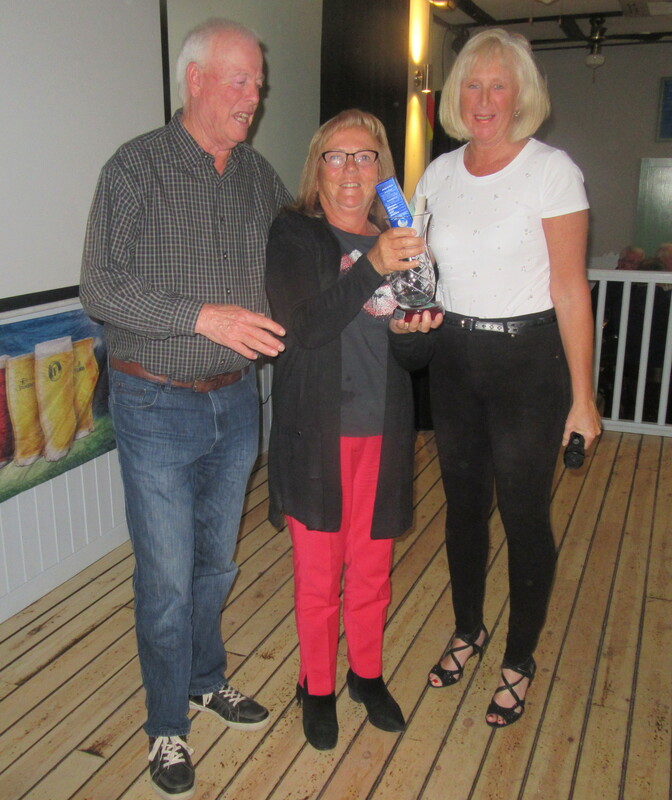 Astri Spieler had the same score as Torild but gave her the prize, a nice gesture! Sorry it is a bit brief this week but I was away in the UK with no wi-fi. This week there were 14 teams, 55 players. Goodbye to Phil Cooke, who has managed the top position so well for the last year. 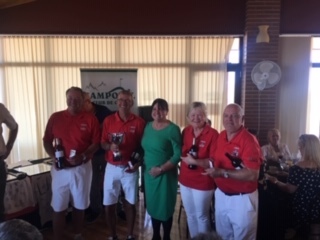 His competition was a 4 person Texas scramble, and it was another triumph for Paul Harrington’s team who won the Camposol celebrity am only 3 days ago in the same format. Sorry it is brief but in UK with no laptop. Again Condado had the winners in this charity event. 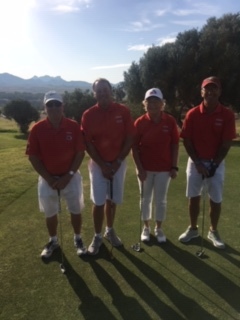 Condado B ( Paul Harrington, Shaun Cairney, Torild and Andrew Lailey won by a country mile with a net score of 55.1 in this Texas Scramble competition. 12 birdies, 2 bogeys and 4 pars made up this fantastic score. Also Andrew had the nearest the pin prize, and Karam Dean won the longest drive! Thanks to Neil Simpson for entering the four teams and making sure we won! 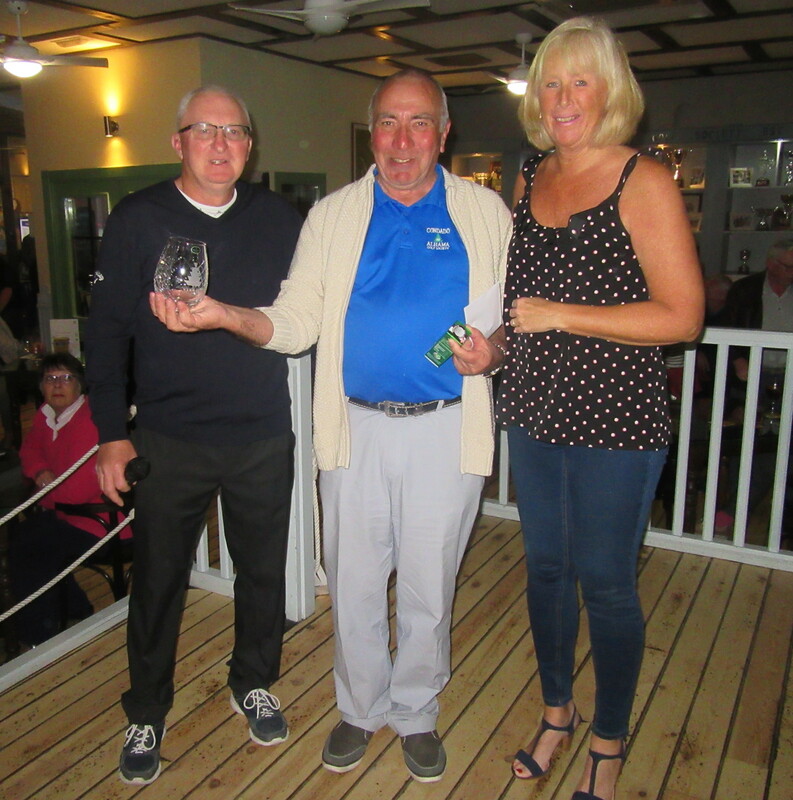 Jan’s first Dublin Crystal to go with his Apollo Air trophies………. 56 players in perfect conditions, and 38pts was enough to take the trophy. 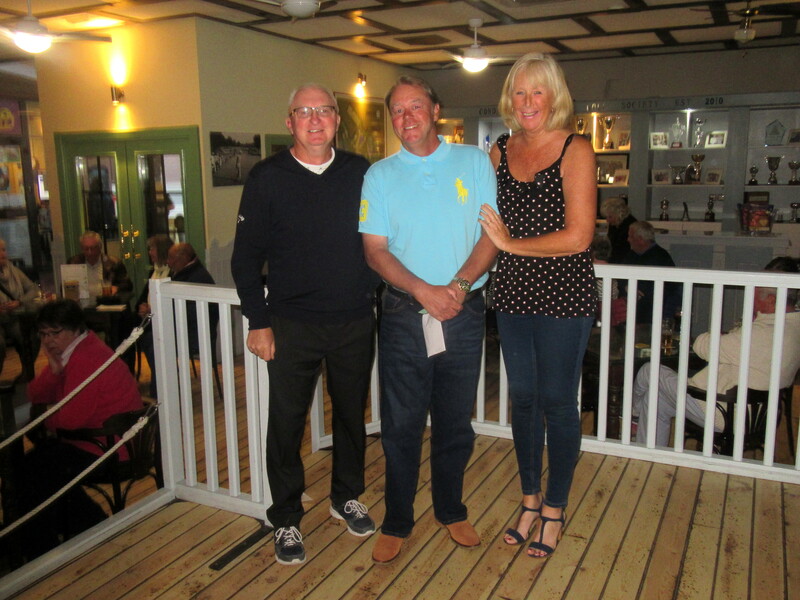 Well done Jan Jakobsen just winning on countback from Shaun Cairney , who was in the prizes yet again! only 2nd this week for Shaun, but a very nice momento. 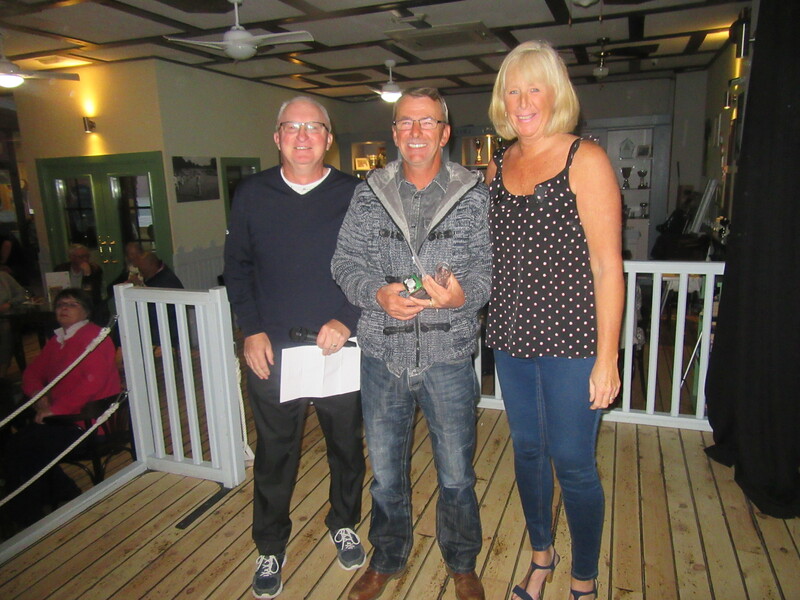 But look below at the handicap review…………..
Ken went in 15 bunkers but still managed to win the 2nd division! 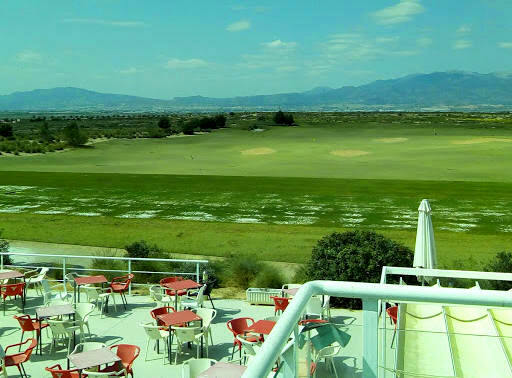 View from clubhouse rooftop terrace over practice area towards the Sierra Espuna ……..
the AGM is on Tuesday, 17.30 for 18.00 at the Condado Club. Here are the motions which have been put forward for discussion. It is proposed that the Ladies and Gents Divisions are merged. Should the Ladies division be scrapped and they are then included in Division 1 and 2, in order for competitions to be fair to all players the maximum handicap allowance for men and women be set at 28 (plus the slope) giving a maximum playing handicap for everyone of 35. During a Monday and Wednesday competition the men play all Par 3’s off the Blue tees. 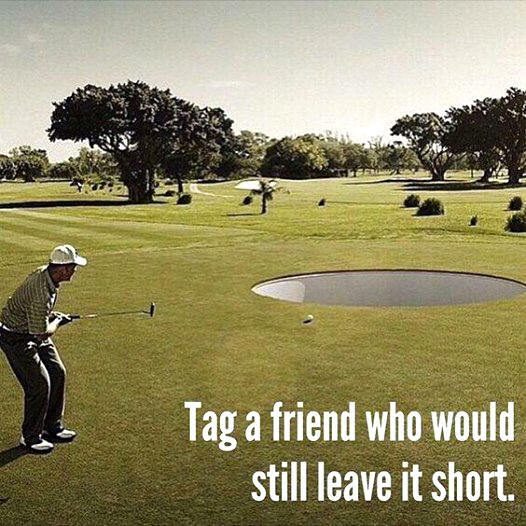 Next week is Phil’s farewell as captain, and will be a 4 person Texas scramble. Alicia’s first competition as captain will be the week after, with the very appropriate Ladies Day. Anyone wanting to go to the evening presentation at La Siena (entertainment from Dee!) should contact Alicia. The course will be very busy next week with over 700 bookings. Even our own reserved times are full, so latecomers are often disappointed. 55 players this week played in gorgeous Spanish spring sunshine. Tanya was back as starter, and took the opportunity to move her desk out onto the terrace in the sun. 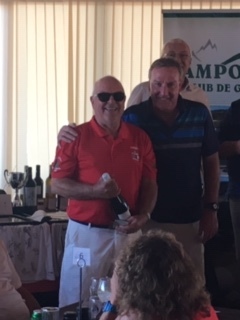 Pat won the par 5 prize as well! 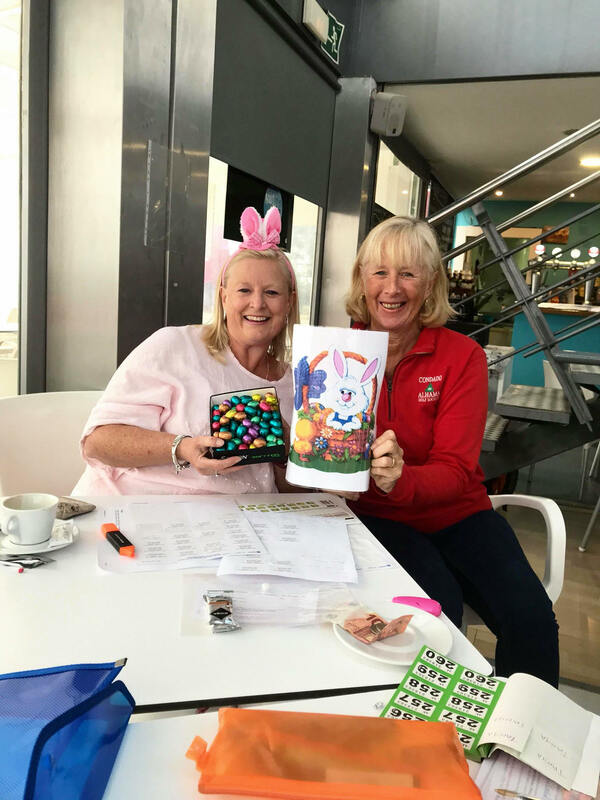 Ellen also managed to pick up two prizes…………. Kevin has been in the winner’s circle a lot lately……………. Chris was nearest the pin on hole 8………………..
Usually we have lots of fancy dress for St Patrick’s Day, but although there were plenty of society green shirts I could only come up with these three photos……………….. 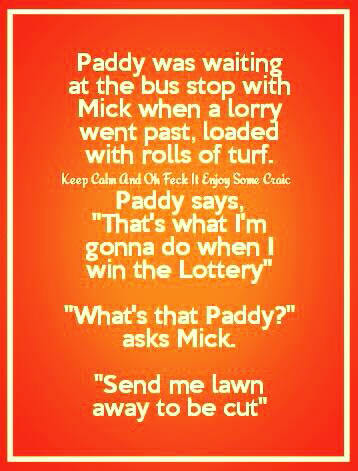 He probably is no saint! 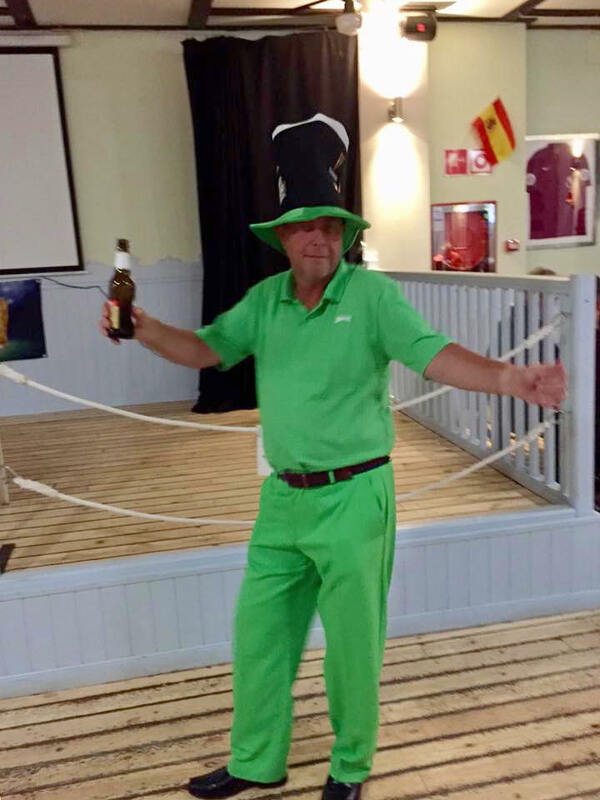 Anthony Keating looks like a proper Irishman…………..
Ladies Day is on April 5th, and any non-golfing ladies are welcome to join in an informal putting competition at 2pm (no doubt with cava to follow!). Our professional lady players will tee off first so as to be back to assist the amateurs! The day is sponsored by Eden Health & Beauty. The evening celebration is now at La Siena in Mazarron town and it will be fantastic to welcome back the fabulous Dee with the entertainment. Price is 20€ to include four course meal, wine, beer, cava and bus there and back. The 2nd away day of the year is to Desert Springs (Almeria) on Monday June 3rd. Included is green fee, buggy, lunch bag and bus travel. Price 50€ (20€ deposit to Ken). 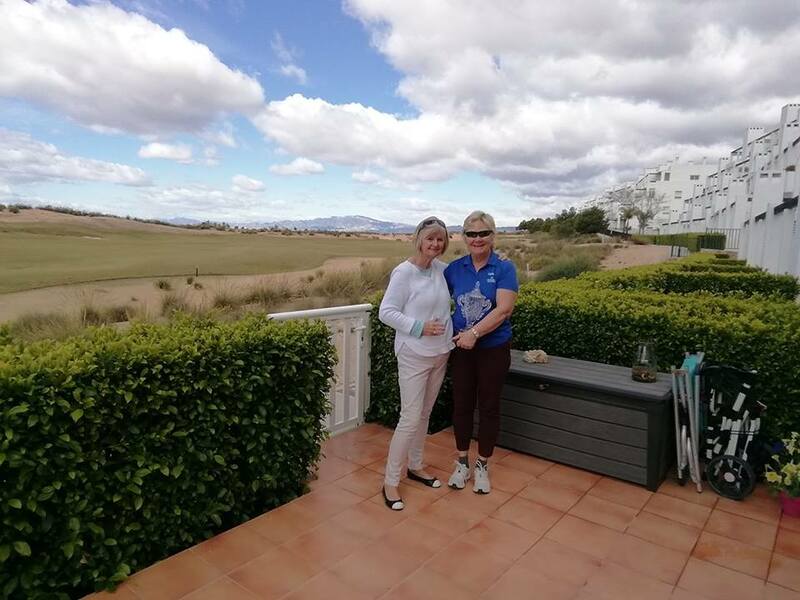 Ladies not golfing will be taken to Mojacar Pueblo. Please be aware that proof of an active handicap is required when joining or renewing membership with the society. If no proof of handicap can be shown then the member will not be eligible to win a major competition until three cards have been returned.